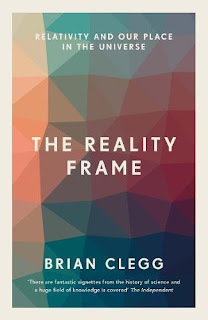 I’ve read quite a few of Brian Clegg’s books, but this one’s outstanding. Relativity is a topic that many writers struggle to get across - Clegg does this brilliantly thanks to two tactics I’ve never seen before. First, he makes use of that most fundamental requirement for relativity, the frame of reference. It’s not just the title of the book that suggests frames of reference - this concept forms the backbone of his exploration of relativity. But then he goes totally mad and builds a universe from scratch! This audacious approach enables us to see, piece by piece, that relativity is about far more than Einstein’s work - fascinating though that is. It’s not that he ignores special and general relativity. There’s even an appendix where he shows how it only takes a maths GCSE to follow the mathematics that make time dilation happen. (I'd like to see more of this kind of thing in popular science books.) But he goes far beyond Einstein's work. For example, in the final chapters he introduces life and creativity to his universe and shows the essential roles that relativity and frames of reference have to play in those cases. In bringing in creativity, Clegg gives the book a human focus, and this then builds to a chance to reassess humanity’s place in the universe. The book mentions Bronowski's classic The Ascent of Man, which is a brave parallel to draw, but there are some real parallels in a very different kind of book. I thought I knew the basics of relativity - yet despite never becoming over-technical, The Reality Frame really opened my eyes to a different way of looking at the universe. Clegg quotes my favourite physicist, Richard Feynman on the laws of nature - this is a chance to see those laws in a new light.